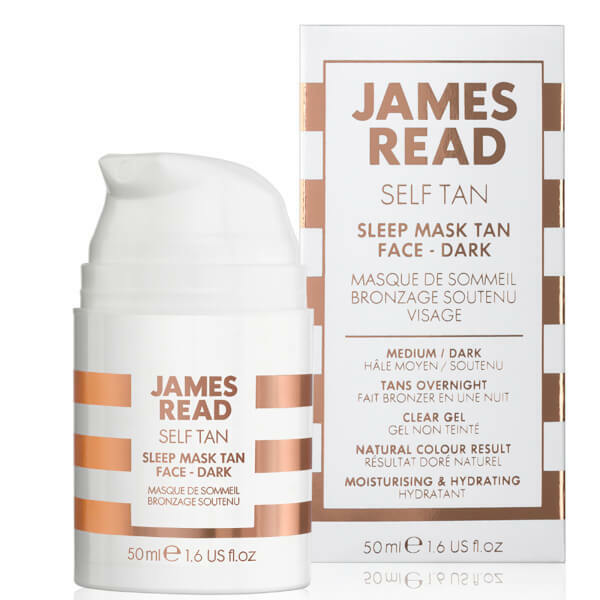 Achieve a sun-kissed complexion with the James Read Sleep Mask Tan Go Darker Face; a revolutionary overnight self tan treatment that creates a deep bronze tan whilst you sleep. Fortified with skin-loving ingredients, including Aloe Vera, Hyaluronic Acid and Black Rose Oil, the colourless, lightweight gel delivers intense hydration whilst providing anti-ageing benefits. Fast-absorbing and easy to apply, you can wake up to a deeply nourished, revitalised complexion with colour that lasts up to five days. Suits all skin tones. 1. Using your fingers, apply a thin layer to clean, dry face and neck. 2. 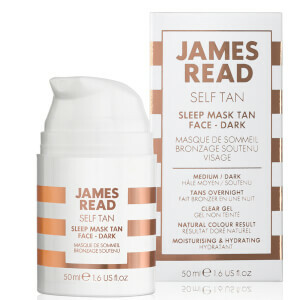 Blend into the hairline and décolletage. 3. Wash hands after use and avoid contact with water for 8 hours. Aqua/Water/Eau, Dihydroxyacetone, Glycerin, Dimethicone, , Aloe Barbadensis (Aloe Vera Leaf Juice, Cyclopentasiloxane, Phenoxyethanol, Polyacrylamide, Cyclohexasiloxane, Propylene Glycol, DMDM Hydantoin, Panthenol (Pro Vitamin B5), Urea, Polyacrylate Crosspolymer-11, Sodium Acrylate/Sodium Acryloyldimethyl Taurate Copolymer, C13-14 Isoparaffin, Hydrolyzed Jojoba Esters, Rosa Hybrid (Rose) Flower Extract, Xanthan Gum Isohexadecane, Polysorbate 80, Tocopheryl Acetate (Vit E), Laureth-7, Citric Acid, Ahnfeltia, Concinna (Algae) Extract, Cucumis Sativus (Cucumber) Fruit Extract, Hyaluronic Acid, Carica, Papaya (Papaya) Fruit Extract, T-Butyl Alcohol, Potassium Sorbate, Sodium Benzoate, Benzyl,Alcohol, Sodium Dehydroacetate, Sodium Salicylate, Citrus Paradisi (Grapefruit) Juice.